When a series of gruesome rituals are discovered in the icy hinterlands of Albyn, three of the realm’s most storied guardians are sent to track down and bring those responsible to justice. Lord Bradon, veteran commander and warrior, driven by his unabating love for a woman forever beyond his reach. Sir Killock, a Templar knight more at home in the endless wilderness than in any castle or court. The paragon Danielle d’Lavandou, heir to the Martyr’s Blade, a legendary weapon guarded by her ancestors for generations. What they uncover is far more than simple murder: a terrifying threat to all the realms of mankind, thought sealed away so long ago that it now exists only as legend. The fate of her friends, and of the entire kingdom, rests in Danielle’s hands. Will she be able to wield the Martyr’s Blade when it is most needed, and what sacrifice will it demand, this time? As crown and temple clash over control of the Blade, Danielle must decide if she will sacrifice life, friendship, and even love, to defy the coming darkness. 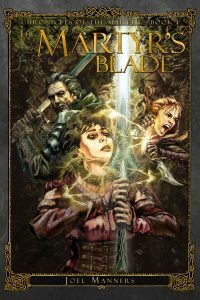 A tale of courage, camaraderie, and sacrifice, The Martyr’s Blade has earned critical praise for its epic story of enduring characters and the stunning world in which they live. Joel Manners has created rich worlds and memorable characters in video games for more than 30 years. 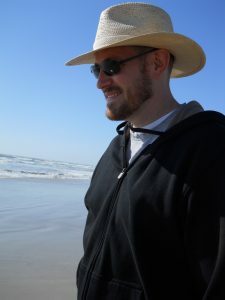 He brings his talent for storytelling to the epic fantasy genre in his acclaimed series, The Chronicles of the Martyr. He lives in Austin, TX with his wife and two boys. And this dog his wife made them get, but honestly, she’s pretty sweet. The dog. His wife too. Although he suspects that might change if she sees this.